Friday January 27th, 2012 I attended the Brock Technology Showcase. Teacher Candidates, Teachers and Principals all travelled to Brock University, Hamilton Campus in hopes of gaining insight to this new, scary world, known as technology in the classroom. The most engaging of the three was Royan Lee's Web 2.0 in the classroom. 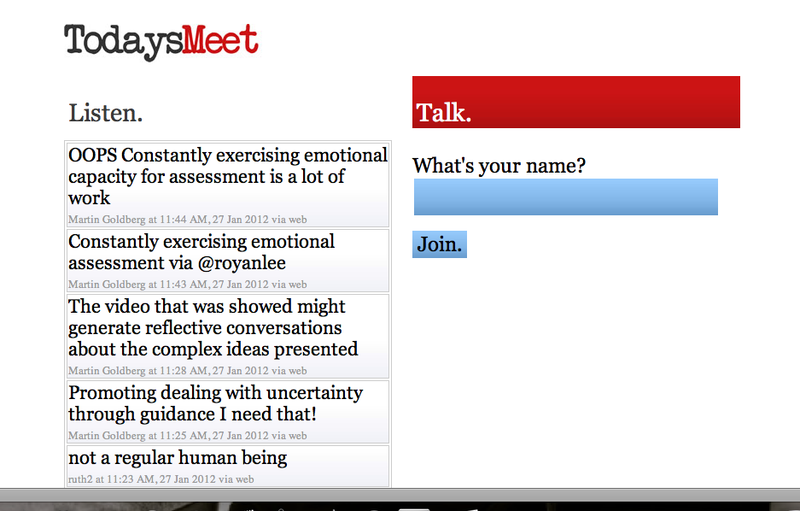 He created a chatroom for the day using TodaysMeet.com. A simple tool that requires no account and creates a temporary chat room (will last as long as the teacher requires it). A URL is created and sent out to students. 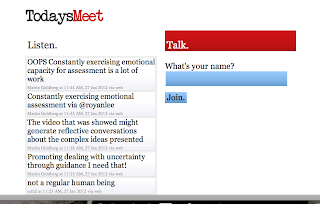 Royan used TodaysMeet as a source of back channelling. Through this tool he promoted classroom discussion, higher order thinking and questioning. As a guide he used FQR - Facts, Questions and Responses. These three letters guided the discussion and ensured accountable talk. The FQR process was encouraged during all activities of the class. This chatroom allowed a platform for all students to participate in. Shy and outgoing students become alike and everyone's answers are heard. This then becomes an important tool for assessment. Royan described situations of diagnostic assessment and formative assessment all through questioning and FQR process. As a participant in the workshop, I found myself more engaged in the story telling because of the constant questioning and discussion taking place on TodaysMeet. Overall, the Technology Showcase truly was a showcase of all things technology. I was exposed to a variety of tools and technologies all guided towards students. It truly is an exciting time to be a student and to be a teacher facilitating this new paradigm.